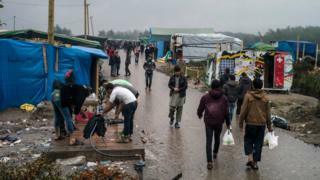 The number of people living in makeshift camps outside the French port of Calais has doubled to 6,000, a French government official has said. Fabienne Buccio told Reuters news agency this was partly due to tighter security measures hindering migrants' efforts to cross the Channel. The Pas-de-Calais department prefect warned other migrants to stay away. Two migrants believed to be trying to reach the UK from Calais have been killed in the past week. A total of 16 have been killed in or near the Channel Tunnel while trying to make the journey from France since June. At the height of summer, the number of migrants living in the camps was about 3,000. In recent weeks, that figure is believed to have reached 6,000, also boosted by the rising number of people travelling there from across Europe. The United Nations says more than 600,000 migrants have arrived in Europe so far this year - almost three times more than for the whole of 2014. Ms Buccio told Reuters: "I do not know what comes next, but 6,000 is the most we can take. "Migrants and people smugglers need to learn that Calais is a dead-end street." New fencing and extra police are making it harder for migrants to smuggle themselves through the Channel Tunnel. "When I started this job early this year they said it took on average three months to get to the UK," said Ms Buccio. "Now, we see that some have been here for eight months and some are not even trying to go across anymore - some are settling here." Her department is receiving more asylum requests than anywhere else in France, she told the news agency. New security measures were introduced at the tunnel's entrance in August to cut the number of intrusion attempts, which reached 2,000 per night at their peak.